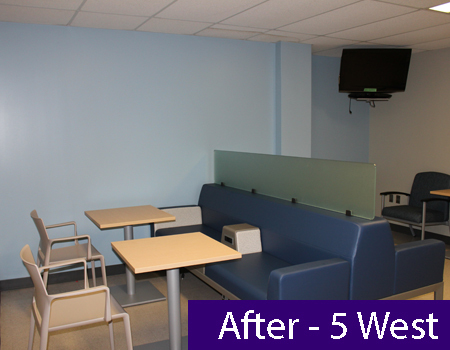 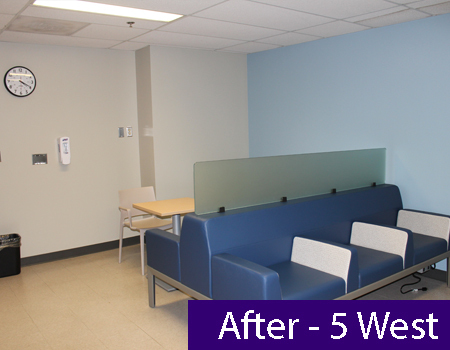 Caring donors, along with designer Karen Miller from Modelo Interiors who donated many hours of her time, helped transform multiple family lounges into inviting, calming and highly functional spaces for patients, family and visitors at Guelph General Hospital. 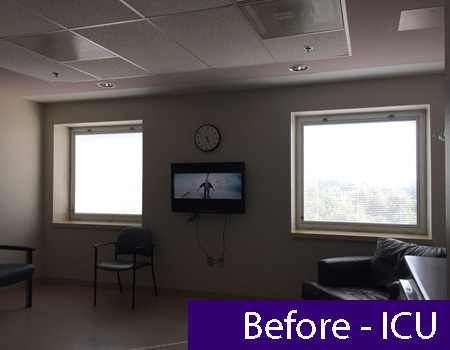 Having a loved one in the Hospital can be overwhelming and stressful, especially when life is at risk and the outcome is not clear. 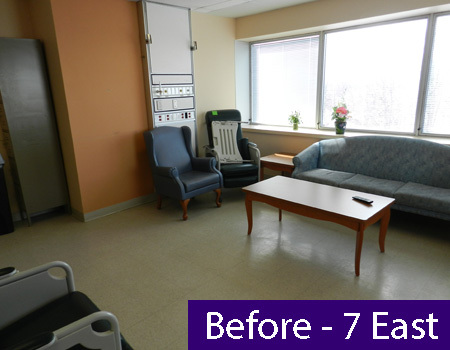 Family members often spend long hours at the bedside of their loved one. 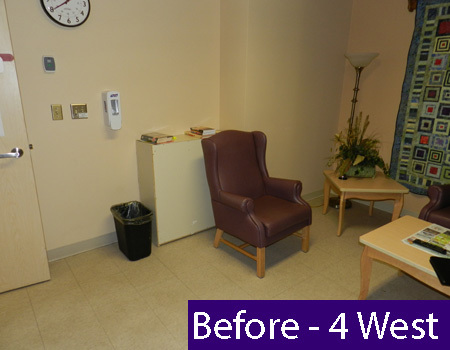 There are also moments, or even longer stretches of time, when some quiet solitude is needed, or when a safe and private space is needed for a family meeting. 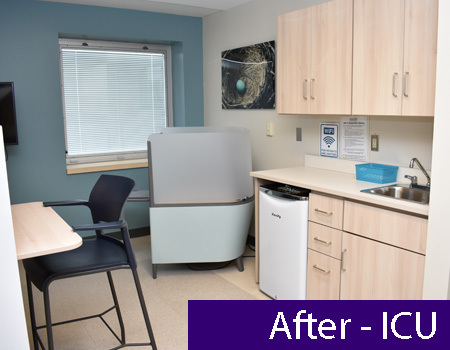 In certain parts of the Hospital, such as our Intensive Care Unit, visitors in patient rooms are limited to one or two at a time, so if there are many visitors, a comfortable space is needed to accommodate them too. 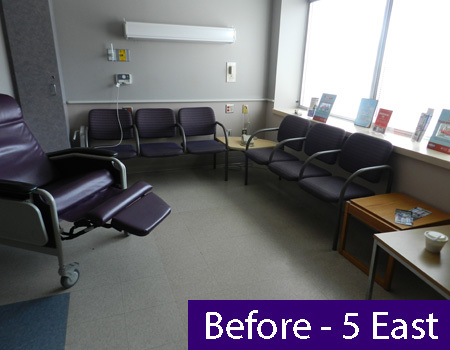 It was a happy coincidence Karen Miller was referred to the Hospital to lead the redesign. 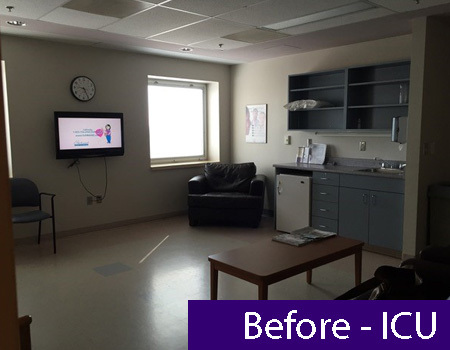 Her mother was an ICU nurse at Guelph General, but of greater influence to her design was her own experience as a visiting family member. 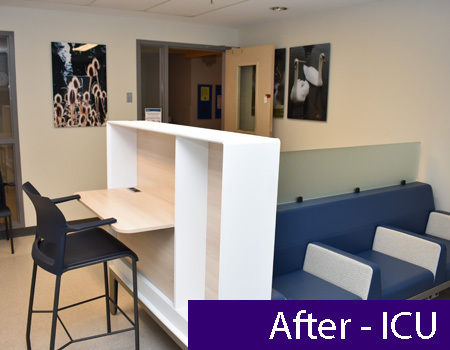 Plenty of careful thought, research and planning went into the redesign, including interviews with family and visitors who were using the spaces. 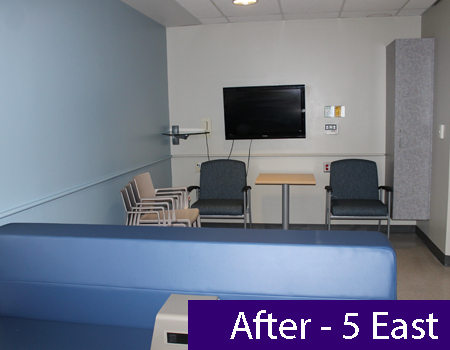 Karen also spoke with nurses and staff in each of the units that had a family lounge in need of redesign. 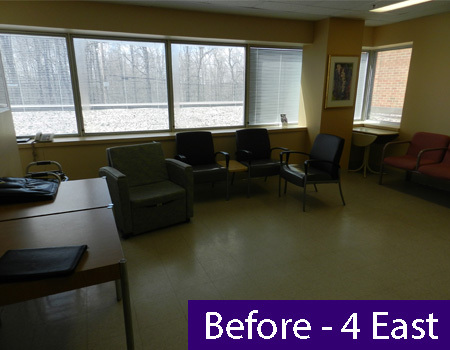 What she discovered was the rooms were each used in slightly different ways in different units of the Hospital. 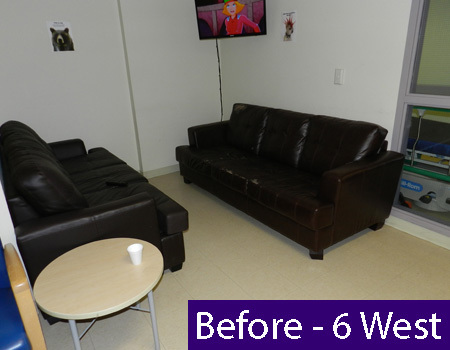 With this knowledge, Karen designed each family lounge to reflect how it is used. 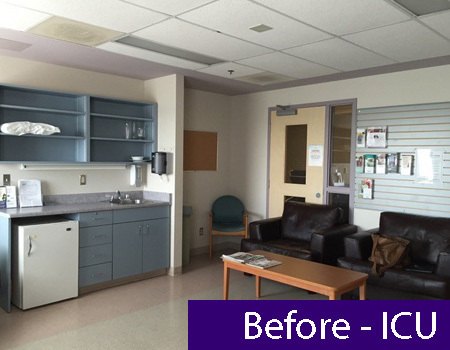 The ICU waiting room is often occupied by individual family members experiencing high levels of stress and highly charged with emotion, often spending long hours over multiple days at the Hospital. 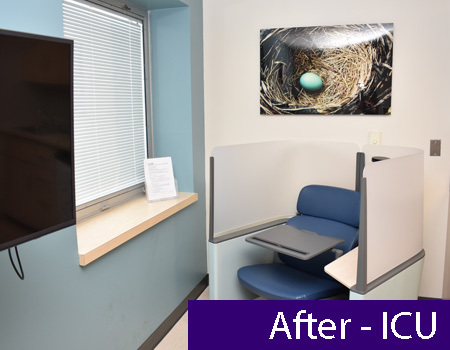 Privacy and solitude is most important to these individual visitors. 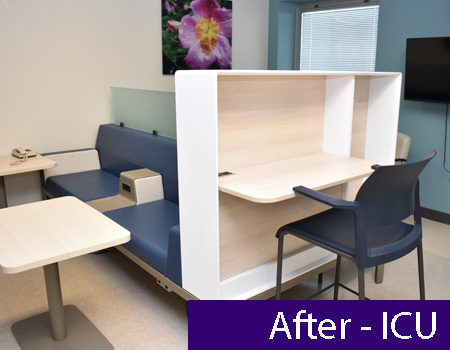 To meet this need, the new design includes spaces where individuals can “cocoon” themselves into a chair or work station. 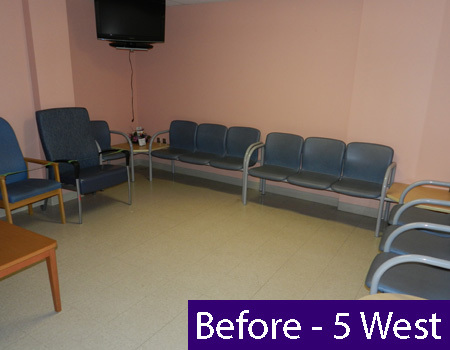 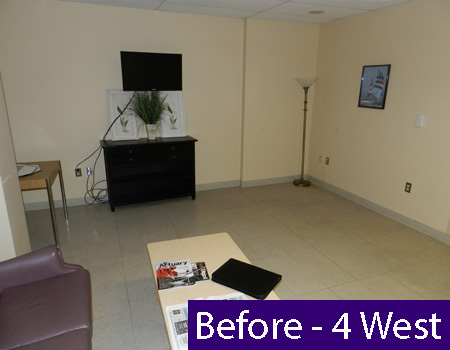 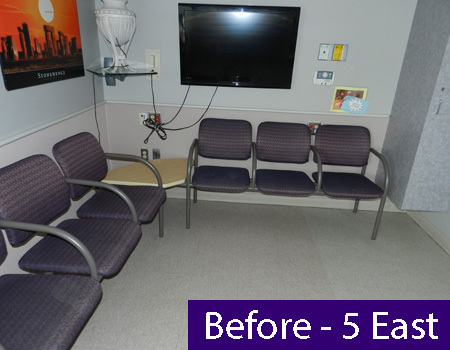 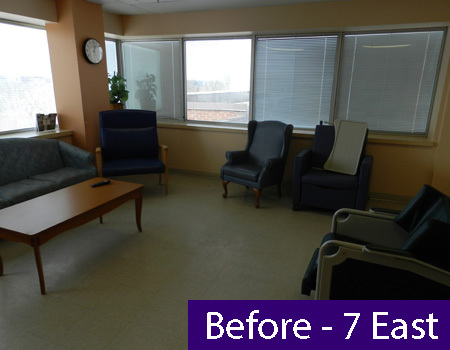 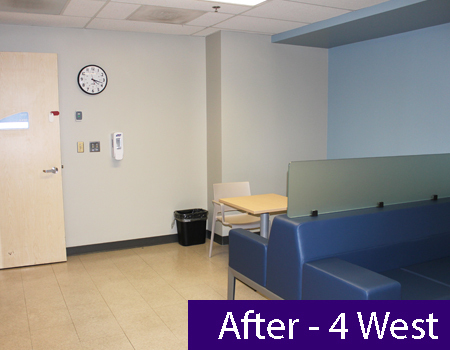 In contrast, the family lounges on 4 and 5 West are often used as a transition space while family members are waiting for a patient to be discharged, or as a social space for family to visit with patients outside of the patient’s room. 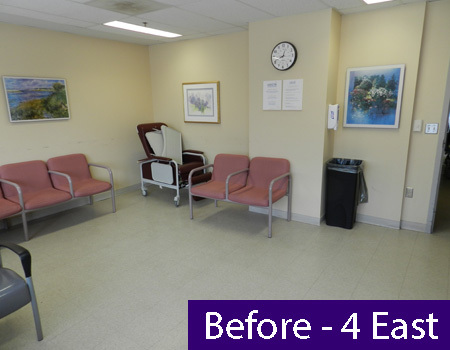 These rooms are designed to accommodate patients in wheel chairs and only include larger groupings of seating for patients and visitors to gather together. 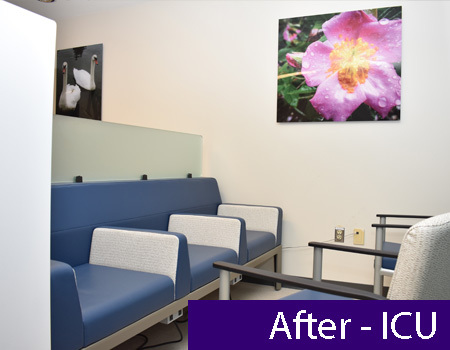 Included in the design of every waiting room are; charge stations for phones and tablets, calming colours and artwork, and modern hospital-grade furniture that meets current infection control standards. 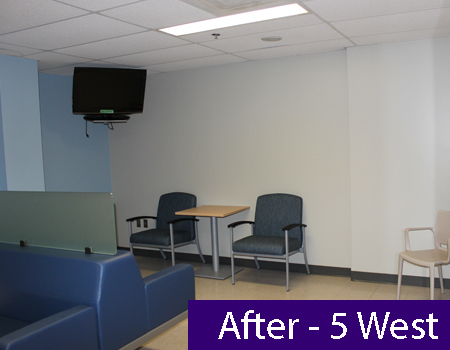 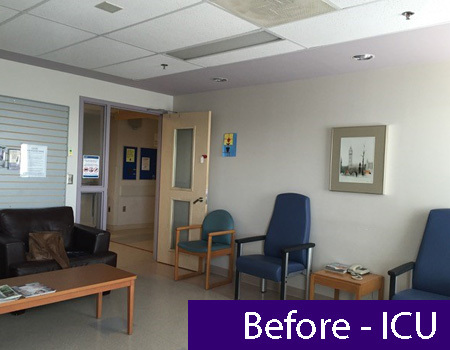 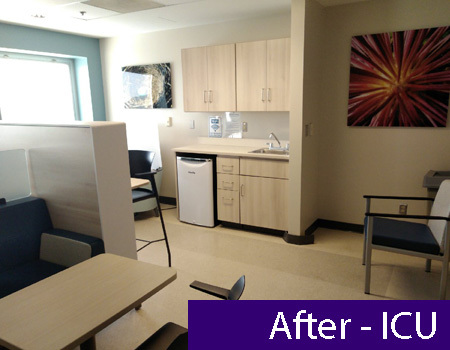 The ICU waiting room was the first to be completed and there are three others that will be complete next month. 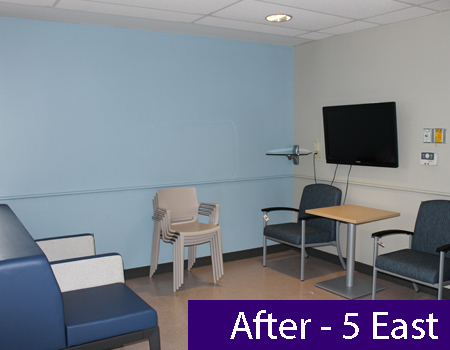 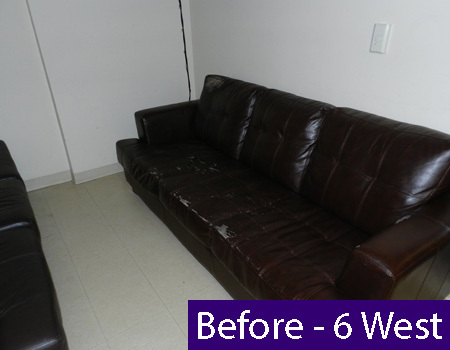 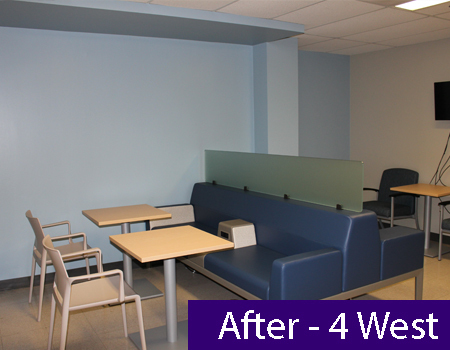 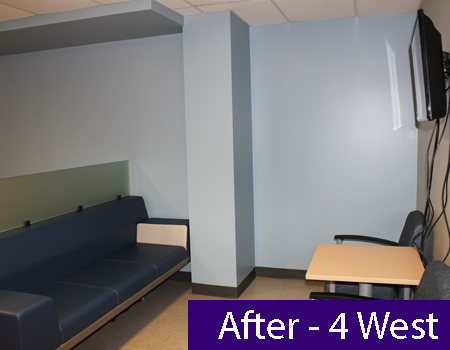 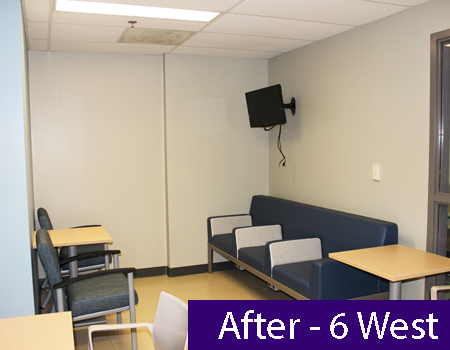 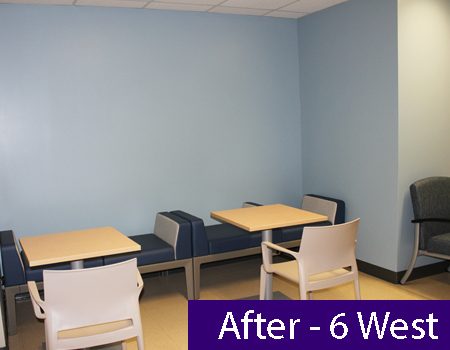 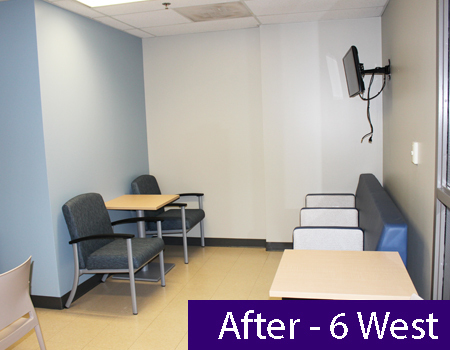 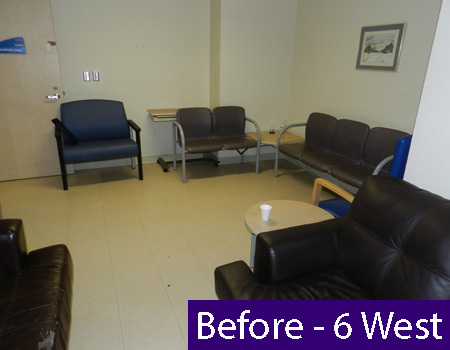 Many caring donors helped to fund the transformation of these family lounges. 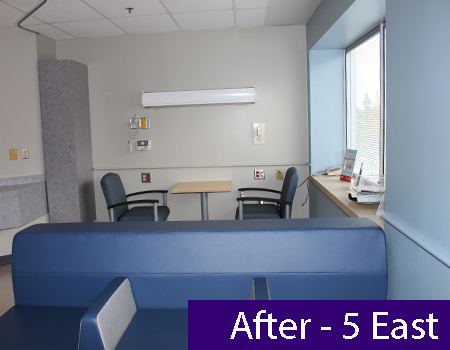 More importantly, they will transform the experience of those that have loved ones at the Hospital. 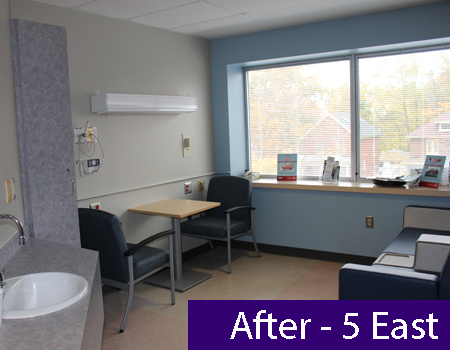 With thanks to these donors, family and other visitors will feel cared for too.